The Predators got off to another hot start in the first period of tonight’s game, but were unable to score. Dallas was also unable to post a marker and the opening frame ended scoreless. The second period began with more pressure from the Stars and just under two minutes into the period, Tyler Seguin shoved a nice pass to Jamie Benn and deflected home the goal to give Dallas the lead, 1-0. Smashville fans were curious at the pregame announcement at head coach Peter Laviolette’s scratches for the night, which included Matt Irwin and Brian Boyle. Two of the “enforcers” on the team. Instead, Laviolette appeared to go with a smaller, faster line-up to counter the size of the Stars and it paid off. 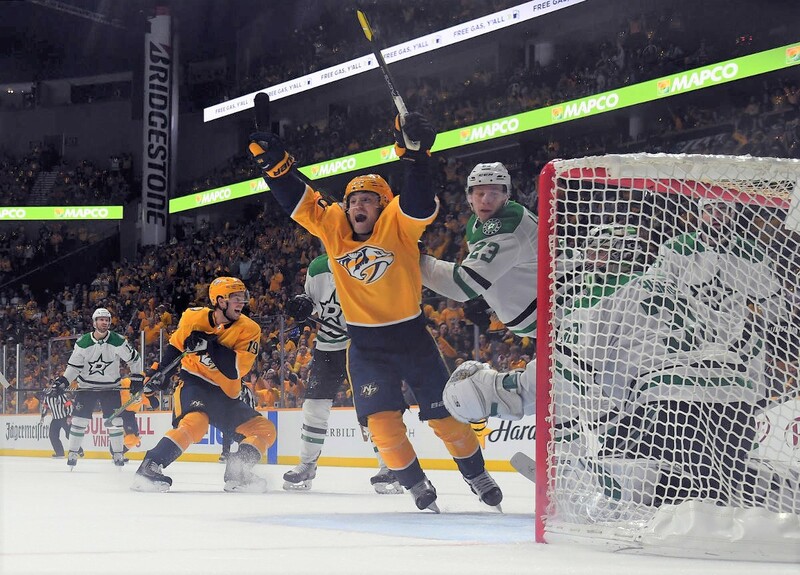 At 3:56 of the second period, 5’6 Rocco Grimaldi took a backhanded pass from Austin Watson and proceeded to score his first NHL playoff goal to bring the Predators even, 1-1. The crowd went crazy for the score from one of the more popular players on the squad. The game was littered with penalties, with the Predators receiving seven penalties, while Dallas went to the penalty box four times. 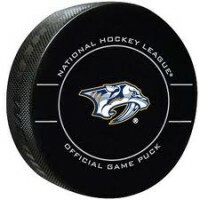 That put pressure on the special teams of the Predators, but the defense was stiff and Nashville held on for a regulation tie and the game went to overtime. The Bridgestone Arena was at a fever pitch when the extra frame began and both teams had chances early to end the game. Then at 5:00 into the OT, Craig Smith located the loose puck in front of Dallas goalie Ben Bishop and tapped in the winner to end the game. Predators get the win, 2-1 and will head to Dallas for game three on Monday night. Nashville fired 42 shots on goal to the Stars 23. Craig Smith was named the first star of the night. Puck drop on Monday night is 8:30 with the game on CNBC. Hank Bonecutter is a retired broadcaster, currently blogging at www.clarksvillemotorcycle.com where he hosts “Dodging the Roadkill a Bikers Journey”, chronicling his travels and experiences on his Harley Davidson Ultra Limited touring machine. As a contributor to the Clarksville Sports Network, Clarksville Online and more, his passion is motorcycles, sports and family. He writes a popular feature at Clarksville Online titled, “My Two Cents” and publishes his travel journal at “Dodging the Roadkill.” A media consultant, and social media advisor, he primarily keeps his followers up to speed on the latest motorcycle news and events. Contact Hank at 61sundance@gmail.com.